If you work in a service industry, chances are time-tracking and timesheets are an integral part of your job. Personally, I’ve always steered clear of any job that required me to give a breakdown of what I was doing at any time (which is a good thing, because my timesheet would include a not-insignificant amount of time dedicated to rearranging my cat’s basket for maximum snuggles). If this cartoon resonates with you, know that you are not alone. Simply hounding staff about tracking time won’t get the job done. First of all, you need to ensure it’s easy for them. We are creatures of habit. If it’s difficult, we won’t do it. Ditch the complex spreadsheets and go for time tracking software instead. Next, make sure everyone understands the benefits for themselves. Tracking time accurately enables your team to build evidence of achievements and improve task focus. And finally, set a positive example. 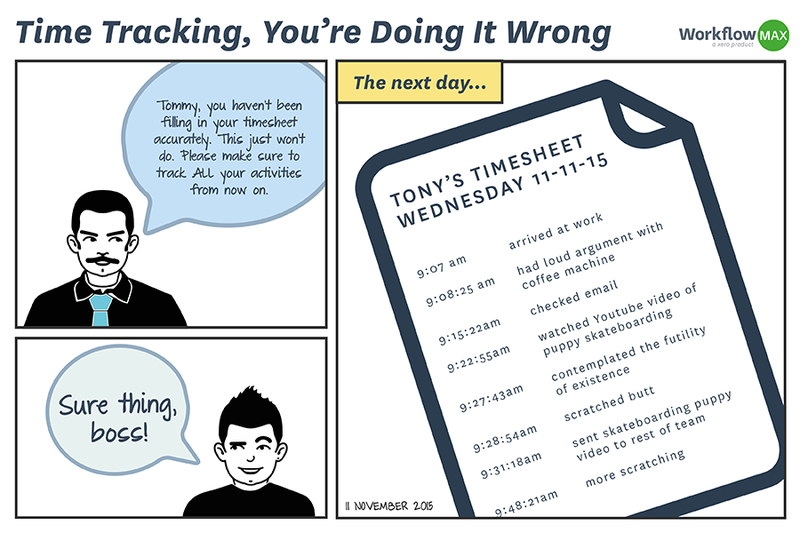 Be the time-tracking champion in your team. Everyone loves a champion. What are you waiting for? Get scratching tracking! What do you think about the new Unconventional Guide? Inquiring minds want to know. Share your feedback.